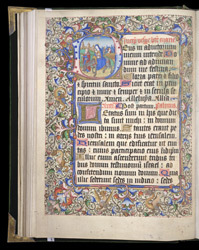 This is a remarkably large and lavishly illuminated Book of Hours, combining French and English styles. The first leaf contains a list of obits members of the royal family and of the 4th, 5th, and 6th Earls of Ormond and their wives, so it was probably made for Anne Boleyn's grandfather, Thomas Butler (1426-1515), 7th Earl of Ormond, or a member of his family. It was given in the early 16th century to a chapel at 'Suthwyke', probably Southwick in Hampshire. In the background of this initial is depicted a popular legend: as the Holy Family were fleeing from Herod, they passed a farmer sowing corn, which immediately grew to full size. Herod's soldiers soon arrived and asked him if he had seen the Holy Family, and he replied that they had passed when he was sowing his crops. Seeing the ripe corn, and thinking that it must have been sewn months before, they gave up their pursuit.